The Sutton family had been landowners in the Nottinghamshire since the 13th century. The marriage of the celebrated ambassador Sir Robert Sutton P.C. K.B. (1671-1746) in 1724 to the widow of the 3rd Duke of Sutherland and the daughter and heiress of Benjamin Tichborne Esq., brought the London estates into the family. The London properties would later enable the family to commission some of the finest Regency silver and to fund the numerous charitable works which still continue to this day. Sir Richard Sutton acceeded to the baronetcy and his grandfather's extensive estates on the death of the latter in 1802. The family held land in Nottinghamshire, Norfolk, Leicestershire and London. During his long minority his wealth increased considerably and on attaining his majority he immediately married Mary Elizabeth, daughter of Benjamin Burton of Burton Hall, Co. Carlow. 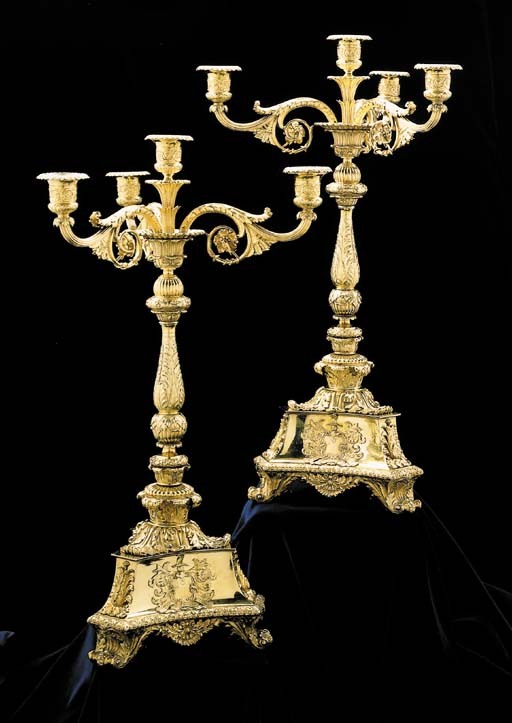 No doubt the present candelabra, and other lots sold by Christie's on 31 March 1976, 11 May 1994, and 5 March 1997, were ordered as part of the plate commissioned to celebrate the wedding. Sir Richard was a keen sportsman, noted for his hospitality and his love of music. Although asked to stand for parliament on a number of occasions he never entered politics, for which he was said to hold particular contempt. His chief interest was hunting at which he excelled. He had a liking for 'difficult' horses and first hunted with the Barton, becoming Master in 1822. He later hunted with the Cottesmore and then the Quorn from 1848, having bought Quorn Hall from the Oliver family. Although a passionate sportsman he also had a love for music and played the flute. He died in 1855 at his London residence, Cambridge House, 94 Piccadilly. His estates passed first to his eldest son John and then to his second son Richard, who was a keen yachtsman and challenged for the America's Cup in 1885.